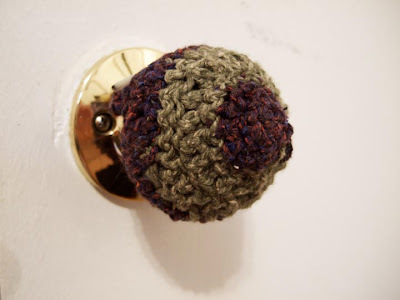 left of nerdy: Knob Cozy. I live in a small apartment with many doors. More doors than I have lived with for a while. I live with two cats, who have fallen in love with slamming these doors. These doors, when slammed, make loud noises and leave marks on the walls. To quiet down this nonsense I made these simple little door knob cozy's. Just another instance of the value of resourcefulness and craftiness. not to mention the lovely tactile feel of a cozied knob. and i'm sure the knobs appreciate their stylish sweaters too, keeping the chill off. love love.